Published: July 18, 2013 at 12:53 p.m. Updated: Jan. 10, 2014 at 02:27 a.m.
Is it better to burn out than fade away, as Neil Young famously suggested and Kurt Cobain infamously cemented? The essence of rock 'n' roll casually embraces the "live fast, die young, leave a good-looking corpse" mantra often mistakenly attributed to James Dean. The essence of football necessarily values survival. Creative angst, abhorrent ambivalence, gnawing anxiety and diminishing passion have no place on the gridiron, a place once described as "an island of directness in a world of circumspection." Rock legends have the luxury of burning out by choice. A football legend simply asks for the opportunity to go out like a man rather than having his career cut down by forces out of his control. When the Detroit Lions announced the release of the concussion-riddled Jahvid Best on Wednesday, my thoughts immediately turned to the NFL's shooting stars. Which players shined the brightest before injuries sent them crashing back to earth? Which transcendent talents always will be remembered for what might have been? No player took the NFL by storm like "The Kansas Comet," who still holds the rookie record with 22 touchdowns in 1965. Sayers' electric moves inspired sports writers to call him "the football version of the three-card monte" and a "moveable feast." Comedian Bill Cosby once described Sayers as "the man who splits himself in half and leaves the half without the football with the tackler." 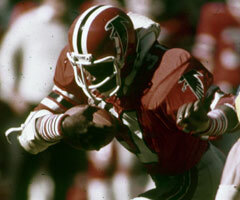 Sayers was the NFL's best runner, most efficient receiving tailback and premier kick returner through five seasons before a left knee injury essentially ended his career in 1970. His half-decade of stardom was memorable enough that he's still the youngest inductee in the Pro Football Hall of Fame. Named AFL Rookie of the Year in 1969, golden-armed Cook averaged an eye-popping 18 yards per completion and 9.41 yards per attempt while playing through a shoulder injury that limited him to only one game the rest of his career. "Greg was the single most talented player we've ever had with the Bengals," team president Mike Brown said last year. Legendary Sports Illustrated writer Dr. Z called Cook a "6-foot-4, 220-pound, blond-haired football god who was going to rewrite all the records." Crediting the former Bengals star with having a combination of Terry Bradshaw's size and strength and Joe Montana's instincts, Hall of Fame coach Bill Walsh once said Cook could have been remembered as the greatest quarterback of all time if not for the shoulder injury. A 1985 baseball scouting report described Jackson as the "best pure athlete in America," which almost seems to sell him short. A freak of nature, Jackson packaged speed and power like no other player the NFL or MLB has ever seen. He combined Adrian Peterson's dynamic violence with Jim Brown's exceptional athleticism, sending Hall of Famer Marcus Allen to the bench. A rare but devastating hip injury ended Jackson's career after four magical seasons. Sharpe became just the sixth player to win the receiving Triple Crown, tallying a then-record-setting 108 receptions in 1992 to go with 1,461 yards and 13 touchdowns. He broke his own receptions record the next year before racking up the third-most receiving touchdowns in a single season in 1994. That three-year stretch with Brett Favre is one of the most statistically impressive in NFL history. A neck injury prevented Sharpe from rivaling Jerry Rice as the NFL's best through the rest of the decade. Rarely has a safety packed so much dominance into so short a time frame. The Seahawks' first defensive superstar, Easley took home AFC Defensive Rookie of the Year award in 1981, AFC Defensive Player of the Year in 1983 and NFL Defensive Player of the Year in 1984. He was the rare defensive back to combine intimidation, sure tackling and elite ball-hawking skills. His career ended with a messy Seahawks divorce after a failed physical revealed a severely damaged kidney, which Easley attributed to high doses of pain killers. The Gale Sayers of offensive linemen, Stephenson was inducted into the Pro Football Hall of Fame despite starting just 87 career games. Arguably the greatest center in NFL history, Stephenson anchored a Dolphins offensive line that allowed the fewest sacks in the league for a record six consecutive seasons. None other than legendary Alabama coach Bear Bryant deemed Stephenson the best player he ever coached. As was the case with Sayers, a knee injury prematurely ended Stephenson's career. Brown anchored the defensive line for Buddy Ryan's immortal "Gang Green" who terrorized NFL offenses in the late 1980s and early '90s. After back-to-back first-team All-Pro selections, Brown was poised to lead the Eagles on a championship run when an offseason auto accident took his life in June 1992. Had he arrived on the scene a decade later, Davis might be viewed as one of the best running backs in history. The Broncos won back-to-back Super Bowls, sporting a gaudy 33-6 record with Davis running for 3,758 yards and 36 touchdowns from 1997 to 1998. Just after taking home both the regular-season and Super Bowl MVP awards in the second of those seasons, Davis went down in 1999 with a torn anterior cruciate ligament, medial collateral ligament and cartilage damage. Aided by advanced medical technology, Adrian Peterson returned from a similar injury to threaten Eric Dickerson's single-season rushing record. Davis wasn't so fortunate. A textbook big, athletic left tackle, Boselli twice was named NFL Lineman of the Year in seven seasons. He was mentioned in the same breath as Hall of Famers Anthony Munoz and Bruce Matthews before a shoulder injury ended his career with just 90 starts. Boselli was so dominant in his first six seasons that he was named to the NFL's 1990s All-Decade Team even though he didn't enter the league until 1995. I couldn't choose between these two versatile tailbacks who dominated the rushing charts in the early 1980s. Rare is the bruising, powerful runner with the versatility to double as one of the NFL's premier pass-catching backs as Andrews did for the Falcons. Hall of Fame safety Ronnie Lott once cited a head-on collision with Andrews as the hardest hit he ever received on the gridiron. 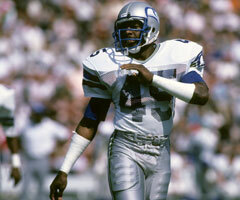 After winning the 1978 Heisman Trophy and the 1980 NFL Rookie of the Year, Sims dashed for 4,419 yards and 37 touchdowns in just over four seasons with the Lions. Both players went down with knee injuries within a year of each other, effectively ending their careers.